Whole grains, like the kind found in whole wheat bread, contain fiber and antioxidants such as Vitamin E and selenium, iron, magnesium, zinc and B vitamins. 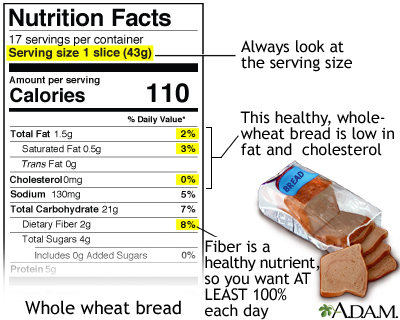 Fiber is a very beneficial nutrient that is found in whole grain products. Fiber helps to reduce the risk for some chronic diseases such as constipation, hemorrhoids and diverticulosis. Fiber is also linked to prevent some cancers like colon cancer. Fiber may help reduce the risk of heart disease and diabetes. It is also a helpful diet aid, it has no calories and helps keep you full longer.